The Seattle SuperSonics got moved to Oklahoma City. Yeah, It's just not OK. 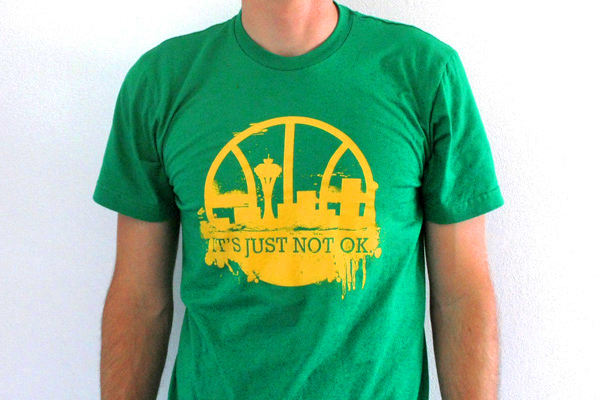 There's a t-shirt you can buy that encapsulates the disappointment of Seattle Sonics fans everywhere, now that the Sonics are being moved to Oklahoma City. I concur. Lower Queen Anne and the area around Key Arena without the Sonics is going to be just a few clown shows, empty food court, and an overpriced not-so-tall needle-like thingie. Oh yeah, and some crazy Frank Gehry building. Kobe Bryant proves he can win championship even with Luke Walton on his team. "I was so sick of hearing people say how I couldn't do it with Luke out there," said Bryant, acknowledging that his teammate's deficiencies have overshadowed the Lakers since Walton was drafted in 2003. "It gets annoying to hear that question over and over, but you can't argue it. You can't deny it. You have to show that you can prevail alongside one of the worst small forwards in the game." "Now I just want to kick back and savor the moment," Bryant added. "I feel like a huge 6-foot-8, 235-pound burden has been lifted from my back." Bryant, who averaged 32.4 points a game and was named MVP of the NBA Finals, played with a fiery determination and lifted his Walton-compensation skills to an almost superhuman level, ultimately erasing any doubt that he was capable of greatness while playing alongside Walton. According to Bryant, it was vital to step up his game and take on a leadership role in order to surmount the countless flaws in Luke Walton's game, which include playing a slow, hindering style of offense that relies on ruining pick and roll plays; clogging up lanes with an ungainly lumbering stride on the transition; and making slow, drifting passes to double-covered players. LeBron is out of the championship hunt. Sadness. Oh well, at least he's still got the chalk. I don't know who came up with this chalk ritual, but it's a brilliant trademark piece of LeBron lore.